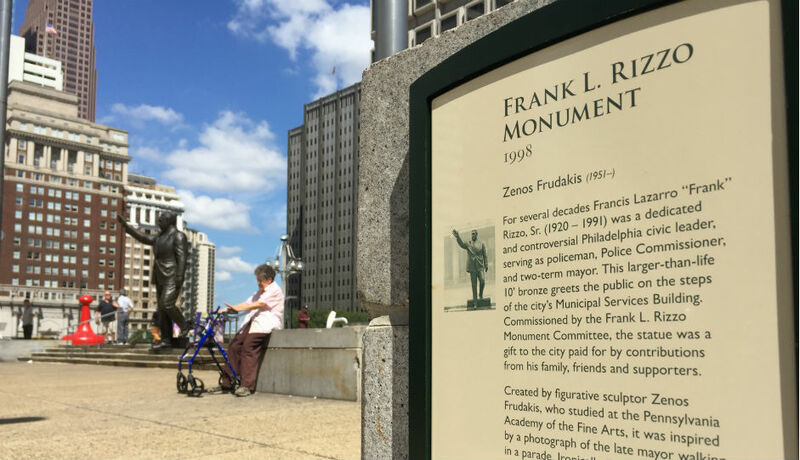 Should Philly Take Down Its Statue of Frank Rizzo? Black Lives Matter activist Erica Mines created a petition to urge local officials to remove the monument across from City Hall. She says Rizzo was a "racist demagogue." By Jared Brey·	 8/9/2016, 10:42 a.m.
Over the last few years, cities and institutions around the country have been struggling with questions about whether to remove public art that depicts racist historical figures and rename buildings dedicated to them. Is it now Philadelphia’s turn to enter the fray? 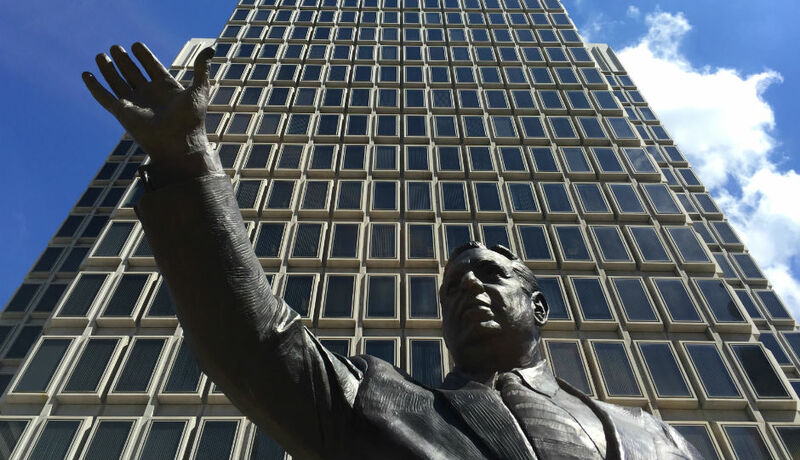 Last week, Erica Mines, an activist who’s been involved with the Black Lives Matter movement in Philadelphia, created a petition asking the city to take down the 10-foot-tall statue of former Mayor Frank Rizzo descending a staircase across from City Hall. So far, 259 people have signed the petition. Mines was not available for an interview. Even when his actions weren’t overtly racist, the nightstick tucked into his cummerbund made it abundantly clear what he was about. Rizzo built his career as a “law-and-order” man, a barely disguised signal that he was the one who would keep (white) neighborhoods safe from (black) criminals. His approach to public life antagonized black communities. Zenos Frudakis, the sculptor who created the Rizzo statue, said last week that the commission to create the piece broke open his career. Frudakis, who also made the well-known Freedom Sculpture at 16th and Vine, said that in the 1990s he wasn’t in a position to turn down such a big project, even if he had wanted to. Frudakis said that he was working on a bust of Wilson Goode, Philly’s first black mayor, at the very moment when Rizzo’s monument committee came to visit his studio and decided to offer him the Rizzo commission. He has created at least three sculptures of the black civil rights leader Martin Luther King, Jr., and he recently installed a statue of the singer and civil rights activist Nina Simone at her hometown in North Carolina. Lee, the city’s Chief Cultural Officer, said she didn’t know of any previous instance in which public art in Philadelphia had been taken down amid controversy over what it represents. 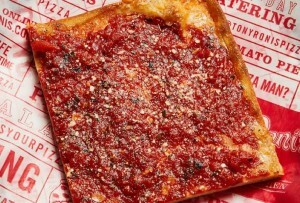 To be sure, Mines’ proposition is likely to be a contentious one: Rizzo still has fans in the city, and they’re often as passionate as his critics. 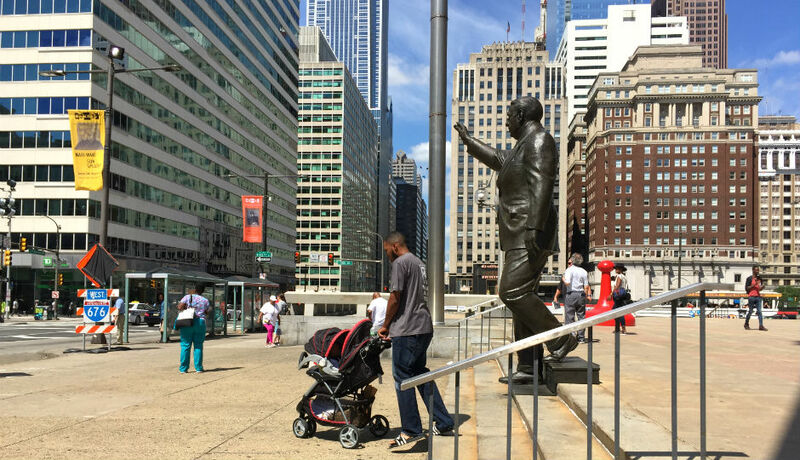 What would it say to take down such a prominent piece of public art depicting Rizzo? Well, it might say that Philadelphia doesn’t want to celebrate a legacy of racism and police brutality. That seems like a thing worth considering.